Yamaha introduces flagship 5000 series hi-fi components | What Hi-Fi? The three-strong range comprises a pre-amp, power amp and turntable, with pricing starting north of £4500. Yamaha is raising the curtain on its new 5000 series of high-end hi-fi components here at IFA 2018. The range will initially comprise the C-5000 pre-amplifier (£6700 tbc, pictured top) and M-5000 power amplifier (£6700 tbc), which are due in November. And joining them next summer will be the GT-5000 turntable for an expected £4600. Both the C-5000 and M-5000 adopt Yamaha’s patented floating design, which ‘floats’ the amplifier circuitry from the ground in the attempt to limit the influence of voltage fluctuations and ground noise. In the C-5000, this is employed across the phono EQ, input amp and line amp stages, while in the M-5000 it is adopted across the entire power amp circuit. With the pre-amplifier, Yamaha has taken further steps to limit unwanted vibrations, such as enclosing the power transformer in a copper-plated case. Thick screw-type wires have been utilised to reduce the impedance of the power supply, and independent dual toroidal transformers for the left and right channels are designed to deliver optimal separation. 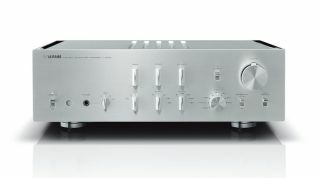 The C-5000 features six RCA (including a phono) and four balanced inputs, with outputs made up of three RCAs and a single balanced connection. With the 100-watt-per-channel M-5000, Yamaha has fixed the power transformer, block capacitors and heat sink directly to the chassis, and given the toroidal transformer a thick brass base, to reduce vibrations, while the power supply is connected directly to each positive and negative side of the output stage. And the M-5000’s most visual feature? The 7mm Asahi glass meters on the front panel. Cue the “ahhhs”. The belt-driven GT-5000 turntable due in 2019 draws both aesthetically and technically on Yamaha’s original 'Gigantic and Tremendous' series turntables, which were characterised by a heavy wooden platter designed to dampen vibrations. Here, however, the pretty hefty 5kg platter is aluminium. The original GT concept utilised the concept of internal mass to counter feedback control - and supposedly this has been built upon with the GT-5000, which aims to negate feedback control through the customised belt-drive mechanism. According to Yamaha, the simple, rigid construction of the short, straight tonearm means there is no need for an inside force canceler weight. And like the C-5000 and M-5000, the GT-5000 sports a balanced connection for a full balanced signal path throughout the chain.